May the Dormition fasting prepare us to receive what God wants to give us. We fast, not to get what we want, but to prepare ourselves to receive what God wants to give us. Every Orthodox Christian is aware and generally knows the reason behind the fasts for Pascha and Christmas. But while they may know of the Dormition Fast, few follow it, and more than a few question why it is there, neither knowing its purpose. First, given the pervasive misunderstanding of the purpose of fasting itself, a refresher on its purpose is always a good idea. There is a perception that we should fast when we want something, as though the act of fasting somehow appeases God, and seeing us “suffer” gets Him to grant our request. Nothing can be further from the truth. It is not our fasting that pleases God, it is the fruits of our fast (provided we fast in the proper mind set, and do not merely diet) that please Him. We fast, not to get what we want, but to prepare ourselves to receive what God wants to give us. The purpose of fasting is to bring us more in line with another Mary, the sister of Lazarus, and away from their sister Martha, who in the famous passage was “anxious and troubled about many things.” Fasting is intended to bring us to the realization of “the one thing needful.” It is to help us put God first and our own desires second, if not last. As such it serves to prepare us to be instruments of God’s will, as with Moses in his flight from Egypt and on Mt. Sinai, as well as our Lord’s fast in the wilderness. Fasting turns us away from ourselves and toward God. In essence it helps us become like the Theotokos, an obedient servant of God, who heard His word and kept it better than anyone else has or could. So why do we fast before Dormition? In a close-knit family, word that its matriarch is on her deathbed brings normal life to a halt. Otherwise important things (parties, TV, luxuries, personal desires) become unimportant; life comes to revolve around the dying matriarch. It is the same with the Orthodox family; word that our matriarch is on her deathbed, could not (or at least should not) have any different effect than the one just mentioned. The Church, through the Paraklesis Service, gives us the opportunity to come to that deathbed and eulogize and entreat the woman who bore God, the vessel of our salvation and our chief advocate at His divine throne. And as, in the earthly family, daily routines and the indulgence in personal wants should come to a halt. Fasting, in its full sense (abstaining from food and desires) accomplishes this. Less time in leisure or other pursuits leaves more time for prayer and reflection on she who gave us Christ, and became the first and greatest Christian. In reflecting on her and her incomparable life, we see a model Christian life, embodying Christ’s retort to the woman who stated that Mary was blessed because she bore Him: blessed rather are those who hear His word and keep it. Mary did this better than anyone. As Fr. Thomas Hopko has stated, she heard the word of God and kept it so well, that she of all women in history was chosen not only to hear His Word but give birth to it (Him). So while we fast in contemplation of her life, we are simultaneously preparing ourselves to live a life in imitation of her. 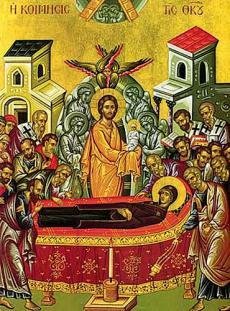 That is the purpose of the Dormition Fast. Daniel Manzuk is a reader at the Church of the Virgin Mary in Alsip, IL. This entry was posted in Fasts and Feasts and tagged Dormition fast, Mary and Martha, Mary as the model of Christian life, the meaning and purpose of fasts, the purpose of Formation fast, Theotokos as a model of obedience.